Description: The plants are dioecious with male and female flowers on separate plants. The tiny male flowers are in dense, pendant clusters and surrounded by large, creamy white bracts. The female flowers are in rounded, pineapple-like flower heads. 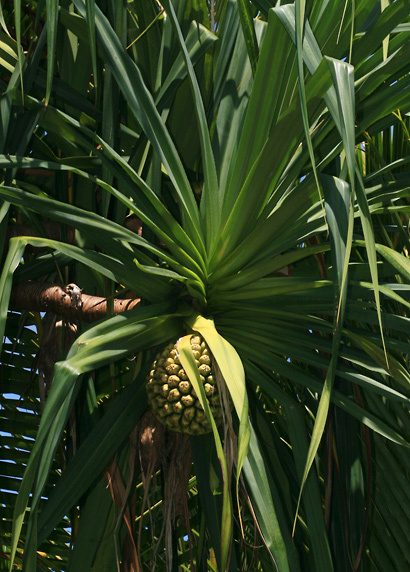 The female flowers are followed by rounded, also pineapple-like fruit heads composed of multiple wedge-shaped fruits. The individual fruit segments have a green top and a yellow, orange, or red base. Tourists and others unfamiliar with Hala may mistake the fruit heads for pineapples, but this plant is unrelated to pineapples. The leaves are dark green, sword-shaped, bent, edged with small, sharp spines, spirally arranged, and densely clustered at the branch tips. Some varieties have variegated or smooth-edged leaves. 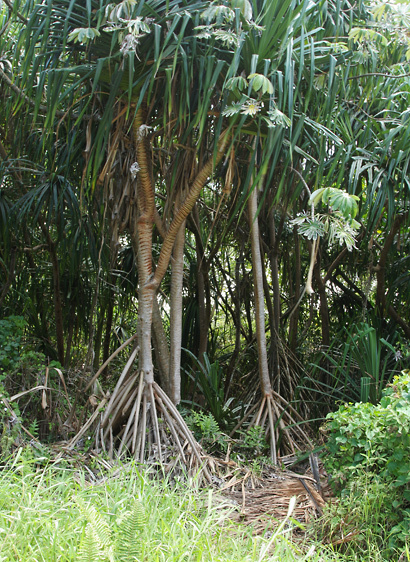 The plants have a slender, upright, branched trunk with brown, ringed bark and a cone of distinctive stilt or prop roots at the base. 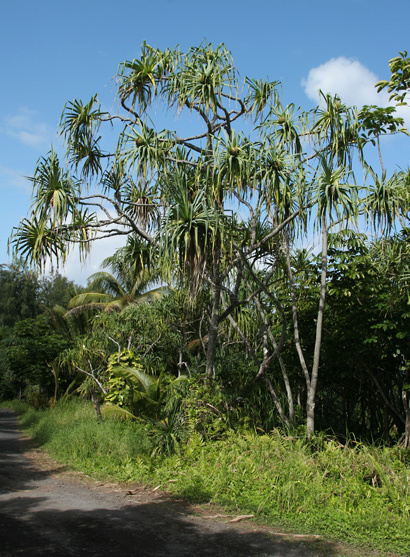 Here in Hawaii, Hala grows in the coastal lowlands, often near the edge of the ocean. The fruit is buoyant, salt water tolerant, and can spread to new land areas by ocean current. 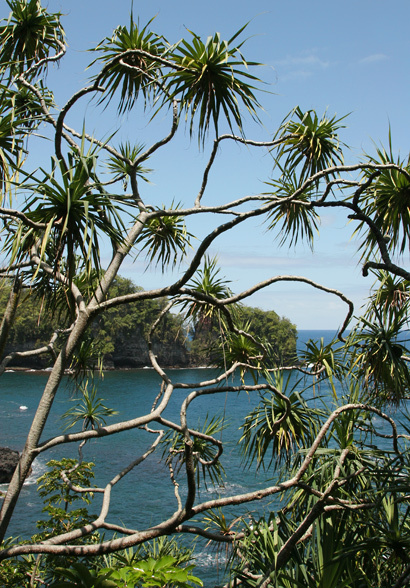 This is the only Pandanus species found in Hawaii. 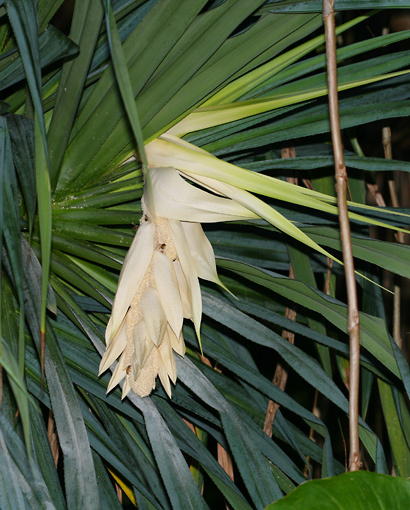 The similar and related 'Ie'ie (Freycinetia arborea) grows as a clinging vine instead of a tree like Hala. Canoe Plant – Although this plant was already here, different cultivated varieties of Hala were brought to Hawaii by the ancient Polynesians in their canoes. The plants were used for a variety of medicinal purposes. 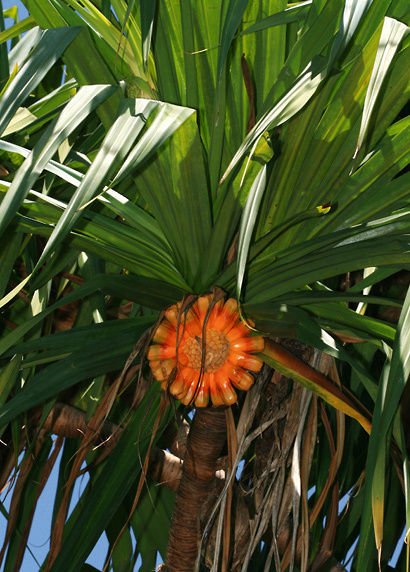 The fruit was eaten and used to make leis. The roots were used for cordage. The leaves were used as thatch and stripped of their spiny edges and woven or plaited into mats, pillows, sails, baskets, hats, sandals, and fans. Many of these items are still commonly made and sold here in Hawaii. Edible – The fruits are edible, and some cultivated varieties have tastier fruit. The seeds and the fleshy, fibrous, colorful base of the ripe fruit segments, known as phalanges or "keys" can be eaten either raw or cooked. Fragrant – The male flowers are sweetly fragrant and attract bees.